Steam saved us this time around. It took a while. But, in 1712, Thomas Newcomen finally had a useful steam engine up and running in England. Like the water wheel, steam power had lurked for a long time before it took center stage. It'd shown itself, but people hadn't taken it seriously. Now, this would be where I might begin telling the history of the steam engine. I've done that in books and radio episodes. It's an intriguing saga. But let us look at the invention of steam itself. How, you ask, can one invent something that nature shows us all the time — in clouds, or in our breath on a cold morning? The problem is, clouds are not made of steam but of water droplets. Steam is water in its gaseous form. Steam is invisible. Once water droplets form, steam has lost its power-producing efficacy. Later, in medieval times, one might find something called a sufflator in a fireplace. It was a metal pot capped with a head with pursed lips forming a nozzle. The fire brought water in the pot to a boil. A steam jet came out of the lips, entrained air into the fire, and kept it burning briskly. Such occasional uses of steam popped up here and there, over millennia. Then, in the 17th century, people realized that the heat in steam gave it an efficacy that cool air did not have. They saw that hot invisible steam, like invisible air, could power things once steam was managed and controlled in special ways. 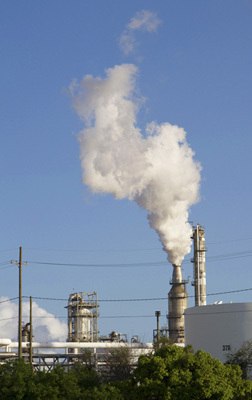 They began proposing steam systems for producing power — turbines driven by sufflator nozzles for example. Or toy turbine-driven vehicles. From Giovanni Branco Le Machine, 1629. 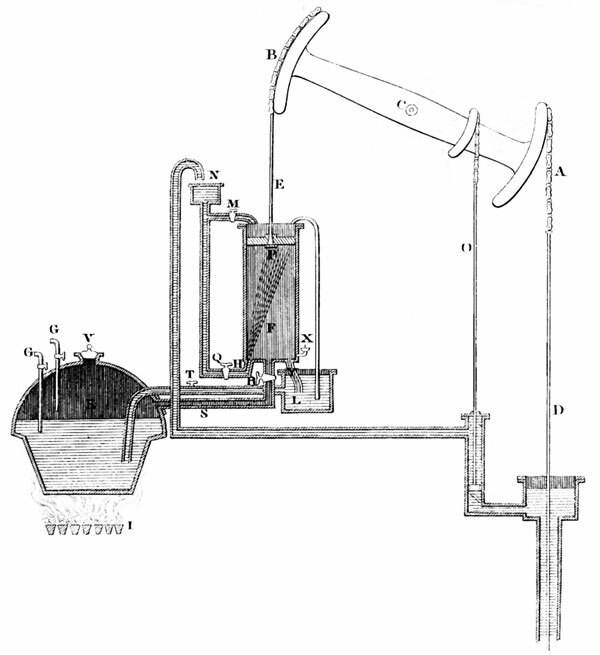 Here a boiler in the form of a Sufflator provides a steam jet that drives a turbine. It, in turn powers a pair of pestles through a gear train. This was never built, but it could have worked. But the turbine (or shall I call it a steam-driven windmill) wouldn't be effective until we could do far better machining — until we knew more about the aerodynamics of blades. We were slow to grasp the simpler idea of building an engine cylinder to contain steam, then letting the steam push upon a piston. Thomas Newcomen finally did something like that in 1712. He let steam condense in a cylinder and pull upon a piston. And, after Newcomen, steam became England's new workhorse. Indeed, it soon became the new power supply of the whole world. Steam turbines would have to wait for the late 19th century. But, three centuries ago, the steam engine took its place in our lives. And steam itself laid its hand upon our imaginations. Newcomen's 1712 condensing engine. From Lardner op. cit. below. So I'm serious about the invention of steam. Sure, steam had been there all the time. But now we'd harnessed it. We could pump out mines and get at all that coal below the water table. Now Progress (with a capital P) was in the air. The eternal delight of energy seemed within our grasp. And we were off on yet another growth spurt. That growth spurt would be called the Industrial Revolution and it would turn the entire world upon its ear. The issues here are treated in much greater detail by J. H. Lienhard, How Invention Begins: Echoes of Old Voices in the Rise of New Machines. (New York: Oxford University press, 2006). Chapters 4 and 5. 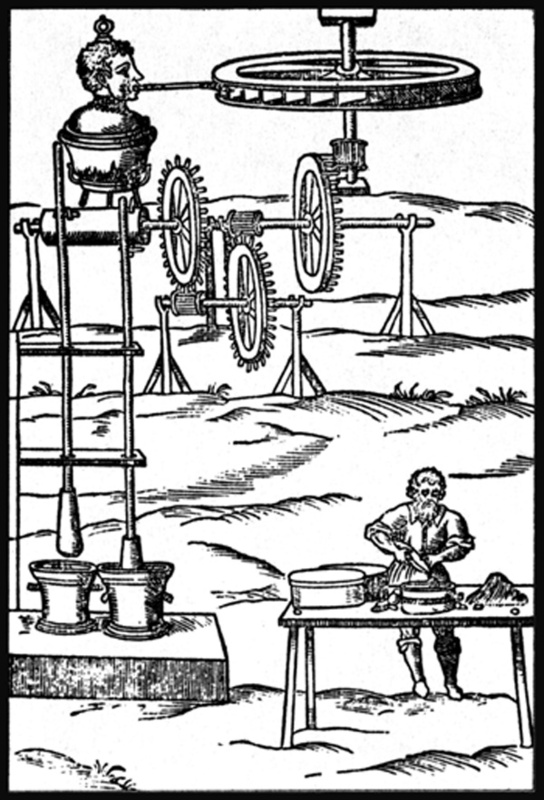 For more on sufflators, see L. White, Jr., Medieval Technology and Social Change. (New York: Oxford Uni-versity Press, 1966): Chapter III. A very complete discussion of the Hellenistic engineers and their use of steam may be found in O. Mayr, The Origins of Feedback Control. (Cambridge, MA, MIT Press, 1970). Lardner, the Rev. Dionysius. The Steam Engine Familiarly Explained and Illustrated, with additions and notes by James Renwick, LL.D. (Philadelphia: Carey and Hart, 1836).